We often have projects which provide opportunities for you to effectively reach an independent, KJV Baptist audience through advertising and sponsorships. On this page you will find our current projects and opportunities. One of our most exciting new projects is a new magazine, Fundamental Matters. This magazine is designed to be a help to pastors. There will be four issues a year, issued quarterly, and each will focus on a specific topic pertinent to fundamental churches and preachers. The magazine will be distributed in print form to about 3,000 pastors, and in electronic (PDF) format to our list of 4,000 preachers in the USA and about 1,500 preachers internationally. We will also solicit paid subscribers for other folks who would like to receive the magazine. The first issue is scheduled to go out in November of this year. 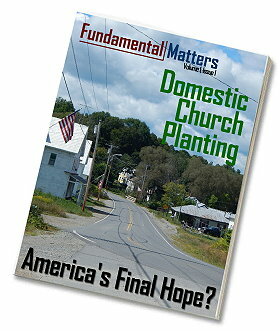 The topic for this issue is church planting, with a tentative title of "Domestic Church Planting: America's Last Hope?" It will contain articles by a number of church planters and preachers who have helped church planters over the years. Other topics are already planned (and many articles solicited) through the end of 2018. If the magazine is well-received, it will continue into 2019. You may subscribe for 1 year (4 quraterly issues) for $12. Classified Ad: $12 for 20 words. 20-cents per word beyond 20. We are offering a 10% discount on all display ads in the pilot issue. To reserve ad space, please contact us. We will reserve the space you want and send a bill. We are producing a printed KJV church directory based on our on-line Worldwide Directory of KJV Independent Baptist Churches at fundamental.org. The directory will be in book form and will be made available at-cost (plus shipping) to those who need it and, in some instances when resources allow, given away. Sponsors will receive a free copy. Along with the printed directory, we will be producing a PDF ebook of the directory for free distribution. As I traveled to present our church-planting work, I found that many churches, including some surprisingly large ones, are still “offline.” The pastors do not use the internet and, in many cases, do not even text. A printed directory will fill a great need for these preachers and churches. This directory will be the “2018 Directory of KJV Independent Baptist Churches” and, if well-received, will be produced every 2 years. The Title Sponsor will have the back cover for a full-color ad (except for the bottom 2 inches, which is reserved for the barcode and publication information). This sponsor will also receive a full page (black and white) ad and two half-page ads inside the book. Ads on the front flyleaf and rear flyleaf are a little more.